Earlier this week this beautiful thing was created in our kitchen. I would love to take credit for it, but the last time I tried to make pie, it resulted in me violently throwing the failed crust dough into the garbage and driving to the store to buy pre made crust. All the credit goes to the husband on this one. Ladies and gents, he's not just a pretty face - he cooks, he cleans and now, he bakes pies. Apple pie to be exact. I wish I could share the recipe with you, but I would totally butcher it and I don't want to be responsible for a horrible pie experience. So instead, I would love to share the delicious and easy caramel sauce Steve made for the apple pie. It can go on pie, ice cream, fruit, or my personal favourite, by itself from a spoon (I was caught redhanded). 1. Mix the brown sugar, cream, butter and salt in a sauce pan over medium-low heat. 2. Cook while whisking gently for 5-7 minutes, until it gets thicker. 3. Add the vanilla and cook another minute to thicken further. 4. Turn off the heat, cool slightly and pour sauce into jar. 5. Store in the fridge. One more day - don't forget to participate in the "What inspires your senses?" photo linkup here TOMORROW, Friday, November 22! More details can be found here. 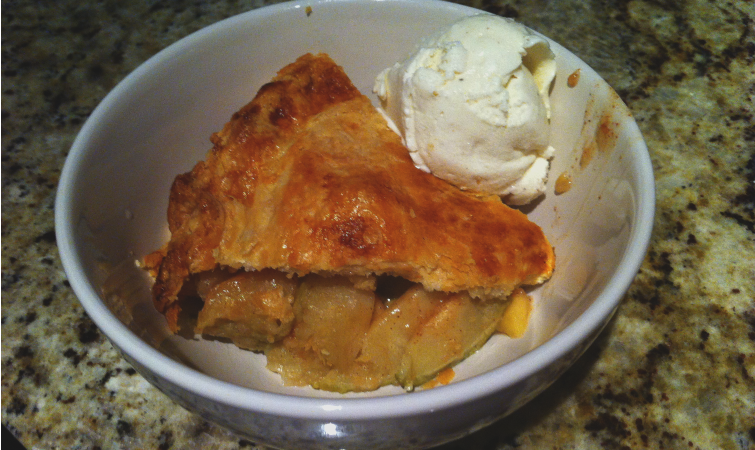 I don't know if it's the fall weather but I have NOT stopped thinking about apple pie and ice cream. And then long behold, that picture smacked me in the face! I'm just going to stay here on this page all day and stare at it, okayy??? Yum! That looks absolutely amazing. I'll definitely have to try that caramel sauce! You know what's funny? I cannot bake cookies for the LIFE of me but I can oddly enough make a half decent pie crust. Key word: half decent. I'm a firm believer that store bought pie is just as good (if not better) as the homemade pie I can make. Not worth the effort in my opinion. Now caramel sauce...that is something worth making yourself. Sounds delicious!